A portal, produced by Keyblade, appeared on the bridge to the palace of the Enchanted Dominion. A bright light shone through, and from within, there appeared a teal-haired, teenage boy with a lavender shirt covered in part by a blue, collared vest. Upon entering this world, his first sight became the castle, which looked quite familiar to him. "Wow. 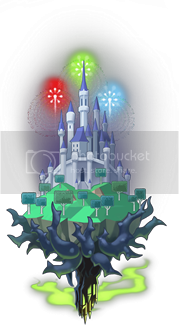 That castle looks almost like the one on my Keyblade. Almost." Out of the very same portal, would come a blonde young woman, who having already visited this world at least once, was content to close the portal behind her. "Your Keyblade has a castle on it? Wow, I am starting to think I have a plain one." young woman mentioned. It was an interesting thing to note though, and something to store away for later. Right at the moment she stood beside the young man looking up at the big castle and chuckled. "I came here yesterday and everyone in the town was super busy... pretty soon they say a princess is gonna be born there... so they are all getting presents for her. It seems pretty sweet." she said imagining the sort of life which a girl like that would live. Loved from the moment of her birth and showered with all kinds of presents. Soon, though she turned on her heels and began walking on the bridge away from the castle and towards the forest. "But... the Darkness seems to come most from that forest back there. I didn't push very deep into it yesterday and I made my quota. And... the enemies aren't that hard to fight either," she stated giving this young man the run down. "Sound like a plan to you?" She asked finally, looking for a bit of input. Lilynette wasn't particularly bossy, and would like to take this time to get to know the young man with her. Asking for his suggestions on her day plan was one such opening. "Well... I wouldn't say it has a castle on it. It'd be better to say it is a castle. Even the shaft is just a tower," he elaborated. He was excited to discover that there would soon be a princess born in this world, and thought perhaps they would get to see the newborn girl. However, the direction Lilynette began walking in was away from the castle, not toward it. She did manage an explanation of why this was the case, and considering their intentions when being here, said reason made perfect sense. "Sounds like a great plan to me! I'll give it all I've got!" he said while trotting along toward the forest. Little did they know, there was a greater darkness within the forest. To be more precise, the depths of the forest contained another castle, in which an evil fairy resided. This tall woman had mint-colored flesh, yellow eyes, a prominent chin, and a black-horned headdress. She wore a black and purple cloak which dragged the floor as she paced around the decrepit castle, tapping her staff against the floor with every other step. "Did you hear, my pets? King Stefan and that consort he calls a queen are having a baby, and soon. I dare say, I've not received an invitation to the coronation. Perhaps there was... an error in the delivery. Some poor messenger MUST have been torn apart entering the forest. Maybe I should pay a visit anyway. I've thought of a wonderful gift for our lovely little princess." "Yep, I definitely have a plain looking Keyblade. That explanation confirms it," the girl mentioned in jest. Beyond this, the young man seemed to be on board with her particular plan for the day. And seemed to want to go, above and beyond the call of duty, in this case. "Huh, alright then. Afterwards, we could have a better look around, if you want. Since you haven't seen as much of this place as I have." She added the last bit in case this one wanted to explore. She didn't know him very well yet, and didn't know the kinds of things he would find interesting in his adventure aside from their general duties. Soon enough she'd enter the forest, and begin pushing towards the castle on the mountain, having no idea what was there. But inside of the forest, the shadows soon began to stir shifting on the grounds. "Don't say that~. I'm sure yours looks awesome!" he said. As they entered the forest, Johan found himself crouching and shifting around thorny vines and other such things. Eventually, the mountain and castle were in his sights. He hadn't expected a second castle to be present in this world, but there it was. This one, however, looked very... uninviting, to say the least. "We're... going to the creepy castle, aren't we?" he asked. Whether this was Lilynette's intention or not, it wouldn't be happening just yet at any pace. Darkness crawled, and Johan prepared by summoning a Keyblade whose guard was a white and blue castle, while its shaft was a particularly long tower connected to an eight-pointed, crystalline snowflake, which formed the teeth. "So... if we're gonna end up in that castle, I could take these guys myself. You could save up some energy just in case, if I did." A laugh would escape the girl. It was quite true her Keyblade looked rather plain, it didn't bother her at all though. It was simply something which she'd made peace with long before this moment. She'd noticed that some people seemed to favor plainer looking Keyblades, particularly, when theirs were more complex or not to their liking. Which she supposed happened a lot while people came to terms with the nature of their hearts. To the question about their actual destination, the blonde girl just shrugged. "I haven't actually been inside that one. From what I gathered yesterday it's home of an Evil Fairy and all the people around here are scared of it. They won't even enter the forest and only send people out here as a punishment. As such, I took to clearing out the darkness here..." she said as the darkness began to move and gather. "I have only just begun to wonder if the source of this darkness is the fairy in the castle. If you want to take this by the way... I am fine with that." she said having watched this young man summon his Keyblade. It had a very interesting look to it, making her wonder if it also had a very interesting ability. As such she stood back, jumping into a nearby tree to see how this young man handled the impending darkness. "Evil fairy, source of high amounts of darkness... going to the scary castle place. Sounds like a plan to me," said Johan. His Keyblade spun around only once in his hand as he stepped toward the swarm of darkness. Since Lilynette had given him the go-ahead, he would indeed be taking on this darkness by himself. Knowing that there was an evil fairy likely to be found in their near future, his belief that her strength would be needed became stronger yet. In the meantime, a cloaked, male figure made its approach on Lilynette from the rear. "Her name is Maleficent," he said in a hushed tone which kept him out of the teal-haired male's earshot. "You should have gone in the other direction. The three good fairies could have told you all about her. Oh, and in case you were wondering... yes, she is most certainly the cause for all this darkness." Several small darkness with glowing yellow eyes, appeared before the boy, finally taking their real forms. A couple lunged at the boy from his left and right while several more swirled beneath him their bodies flush against the ground. While this happened Lilynette was content to watch and see what the boy did in response. But before she could properly think about this someone spoke to her, it was so very sudden on her perch in the tree that she materialized her own Keyblade behind her without changing her position while the voice spoke to her. "Yo, it isn't nice to sneak up on people like that," she mentioned, though it was very interesting information she was being given. "Maleficent, huh? Well, that name sounds a bit sinister, but if she is actually the cause of all this darkness, that is pretty well... intimidating." Lily mentioned as she allowed her eye to travel behind her to where this cloaked male stood. "Oh? It's you... what are you doing here?" "That's my line. I was here first," the man, whom Lilynette was sure to recognize as the Master Luxu, replied. Back on ground level, Johan was finally faced with the true forms of these dark creatures. There was nothing he could physically do about the ones beneath him for now, but he certainly had a plan for the ones closing in around him. He leaped into the air, aiming to have the dark beings crash into one another where they would have instead struck him. From above, he then raised his Keyblade overhead and wrapped it in wind. As he came down, he also swung the Keyblade downward with the intention of striking through the group of dark creatures, while also repelling their bodies in the process. "Maleficent calls herself the Mistress of all Evil, so the good fairies say," Luxu said as he leaned over the blonde girl's shoulder, and watched the fight occurring below. "She's pretty strong. That loops back to why I'm here, actually. I figured you'd want a little boost to the power you have already."